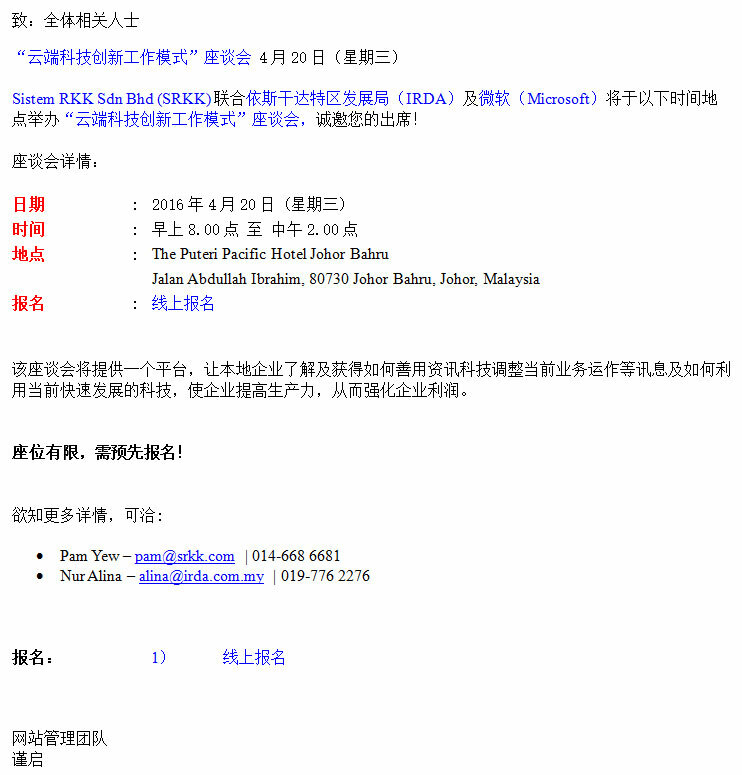 Please be informed that Sistem RKK Sdn Bhd (SRKK) in collaboration with Iskandar Regional Development Authority (IRDA) and Microsoft would like to invite you to participate in the seminar on Innovation@Work Empowered by Cloud on 20th April 2016 (Wednesday). At the Innovation@Work empowered by Cloud seminar, we combine experience and expertise to deliver on Microsoft’s vision to empower every person and every organization on the planet to achieve more. Microsoft expertises are your trusted advisors who will listen to your aspirations and challenges and are dedicated to seeing you succeed. Innovation@Work Seminar. Gain insight on how you can align your business to IT: Meeting a balance with fast moving technology transformations like cloud and enabling the business to enhance productivity while maximizing profit. Seats are limited, pre-registration is required.